We have had amazing comments regarding the success of the last Internet Telephony Conference & Expo from many attendees and exhibitors. We just recently posted some more photos of the event so you can get a feel for it yourself. The new videos are still in production and I hope they are posted very soon. I will let you know when they are. 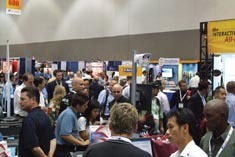 In the mean time mark your calendars to be in Miami January 23-25 in 2008 for Internet Telephony Conference & Expo East 2008.